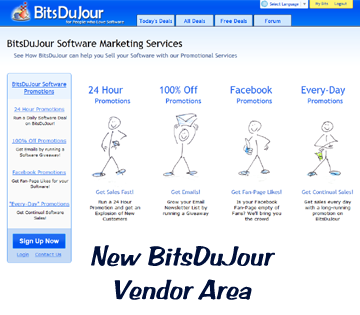 Happy New Year from BitsDuJour - and to celebrate we've got something new just for you, our software vendors! That's right, a brand new Vendor Area! We've made it super easy to see all your promotions, and set up new ones, and we've now got "Take a Tour" clickthroughs that will show you exactly how all our promotions work.